The driver of a transport truck has been charged with careless driving following a crash that closed Highway 400 near Barrie this morning. Speaking to CP24 on Monday morning, Ontario Provincial Police Sgt. Kerry Schmidt said a transport truck was heading northbound on the highway near Innisfil Beach Road when the driver lost control and took out the guardrail. Parts of the guardrailrail, Schmidt said, ended up in the southbound lanes of the highway and a southbound transport truck driver hit the damaged rail and ended up in the west ditch. No serious injuries were reported but the highway was shut down in both directions between Innisfil Beach Road and Mapleview Drive. 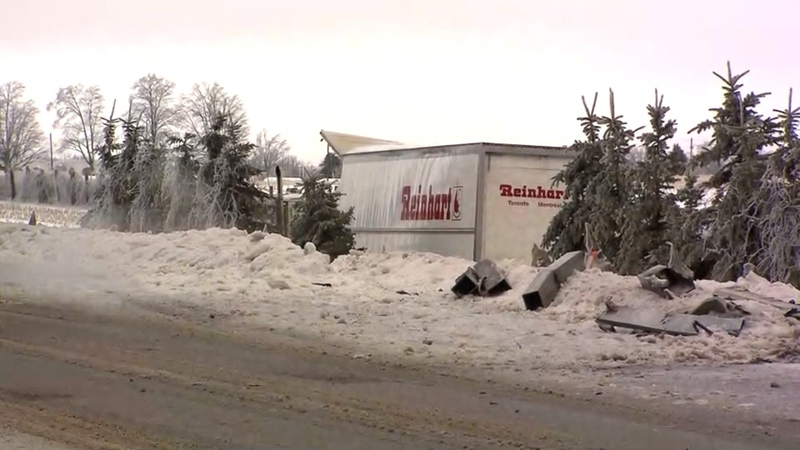 Schmidt said while the weather conditions weren’t ideal this morning, police believe the northbound transport truck driver is at fault and he has now been charged with careless driving. “Really it comes down to driver error,” Schmidt said. The crash resulted in a diesel spill and crews are continuing to clean up the highway. All lanes of the highway reopened at around 3:30 p.m.
Crews are cleaning up Highway 400 in Barrie after a crash led to a diesel spill this morning.